āsum is a line of elevated basics that strives to be inventive in design yet effortless in style. It is quiet creativity with timeless practical sensibilities. āsum is about slow fashion, not trends; it is about creating distinctive pieces to complement casual staples in one’s wardrobe season after season. 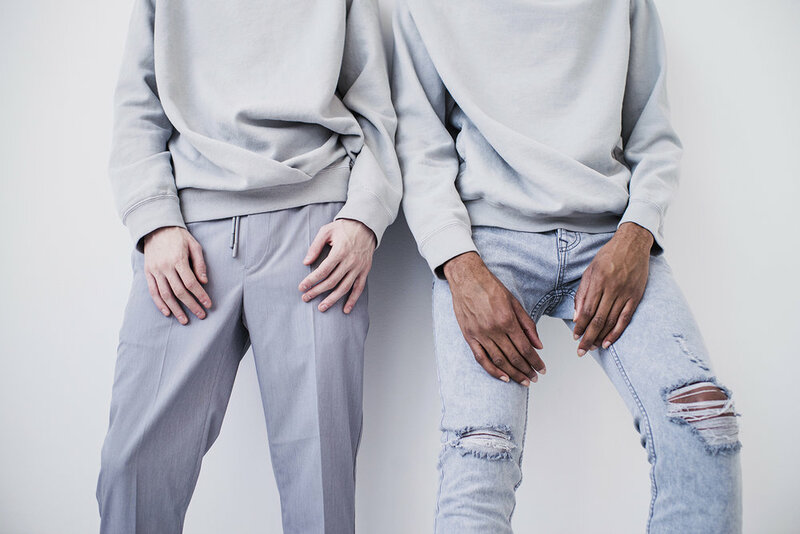 This project is about freeing the classic elements of a sweatshirt into a less expected form. After seeing my mother produce sweatshirts for decades that all appeared a bit too similar, this is my attempt to bring a new artistic perspective to the Canadian/American wardrobe staple. The collection is domestically made and eco-friendly—crafted in Canada with sustainable organic cotton. An artful play of luscious cottons and linens intermixed with rich quality full grain leathers. See Kickstarter story here. Since I was young, I chased creativity in clothing. The artful ways fabrics drape and fold on our bodies, it intrigued me. Naturally, I had big dreams to become a fashion designer. However, facing harsh financial struggles at a young age, with a first job packaging sweaters for pennies, I grew to be very practical and followed a career in computer engineering. Nonetheless, my dreams never faded. For a decade, I juggled working as a techie by day, and designing and sewing by night. I proved my talents winning FIT's Outstanding Design award for Draping Specialization in 2009, a finalist spot in Charleston's Emerging Designers Competition in 2012, and in 2014, a stint on Project Runway season 13. I finally launched āsum in 2016 with a successful Kickstarter bag collection. I grew up in the apparel manufacturing world. My mother is a veteran in the industry. To help pay my way through school, I worked all odds and ends in garment factories. Additionally, I have had the opportunity to learn tailoring and couture techniques from skillful masters at FIT. Thus, with immense respect for the backbone and the artistry of the industry, āsum only seeks to partner with manufacturers that uphold a high level of quality and ethical practices.